2012 Hardys Joins FEED Tree Planting | FEED, Inc.
22 November 2012, Makati, Philippines. Earlier in October 2012, Hardys expressed its keen desire to support a social project in the Philippines, one related to sustainable development and a cause complementary to its industry (Food & Beverage). FEED was invited to share it’s mission and to find out whether any synergies could exist. Due to FEED’s scholarship focus on food security, the Board decided to initiate the partnership with Hardys, at their next wine & dinner tasting on 22 November 2012. Learn what makes Australian wine so great from the Master himself! 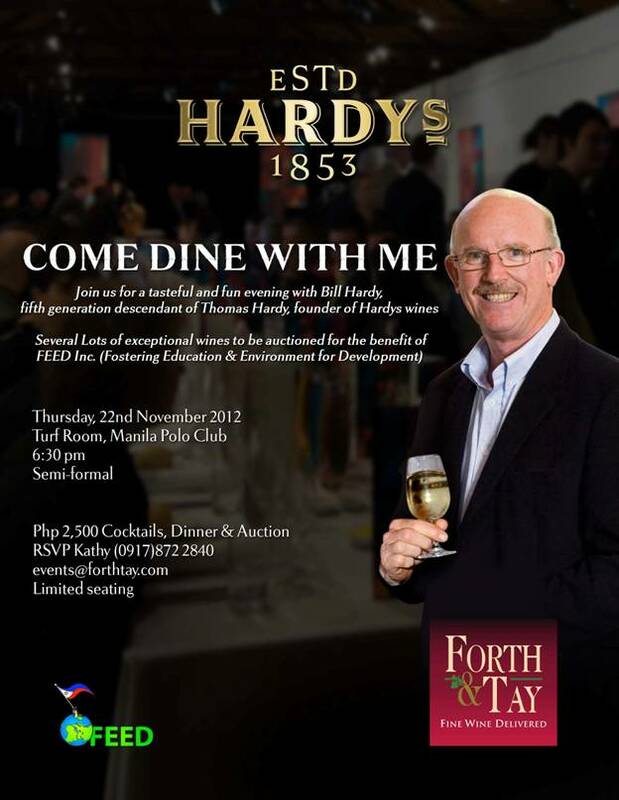 The leading wine company Forth & Tay is hosting the Hardys Wine Dinner & Auction at the Turf Room of the Manila Polo Club on Thursday, November 22 at 6:30 p.m. The evening, which is limited in seating, consists of a tasting, four-course dinner with wine pairings to be followed by an auction. Proceeds from the evening benefit will benefit FEED, an NGO dedicated to the sustainable development, preservation and rehabilitation of forests, farms and the environment in the Philippines. FEED also provides deserving, under-privileged individuals with scholarships to conduct research in the fields of Agriculture, Forestry, Environment and Food Security. FEED will be auctioning a stunning Pointillist art piece by the acclaimed Philippine artist, Nena Saguil. For more information on this event, click here. Or email info@feed.org.ph / call +63 917 552 4722.